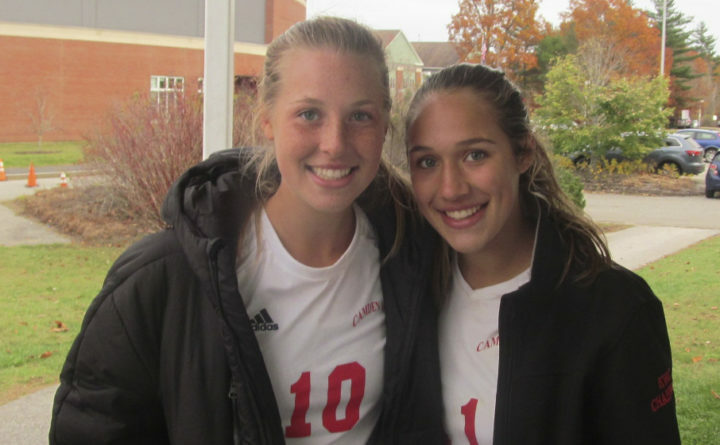 Midfielders and sisters Kassie Krul (left) and Kaylyn Krul controlled the midfield on Saturday as Camden Hills High School of Rockport beat Scarborough 1-0 for its third straight Class A soccer state championship. Very few goals are scored from the middle of the soccer pitch. But that is precisely where the Camden Hills girls soccer team earned its victory on Saturday morning. Sisters Kaylyn Krul and Kassie Krul dominated the midfield with their strength and skill, helping the Windjammers of Rockport keep the pressure on Scarborough en route to a 1-0 victory in the Class A state championship game at Morse High school in Bath. The win secured the third consecutive state title for coach Meredith Messer’s team, which capped an 18-0 season while running its three-year record to a sparkling 52-1-1. Saturday’s score did not demonstrate the completeness with which Camden Hills controlled the game against Scarborough, which finished at 17-1 with its second straight championship game loss to the Windjammers. Junior Ella Pierce scored the game’s only goal in the first half, but Camden Hills had several other quality scoring chances on which it did not capitalize. And had it not been for the aggressive play of Red Storm goalkeeper Nicole Young, who made numerous saves, the Windjammers might have won by three or four goals. Even though Scarborough, like all of Camden Hills’ opponents, had to cognizant of talented strikers Kristina Kelly, Pierce and Eliza Roy, it was the Krul sisters and their midfield counterparts, including Anya Babb-Brott and Lexi Heidorn, who initiated attacks and neutralized most of the Red Storm’s potential forays into the offensive third. Camden Hills got the only goal it would need 17 minutes into the contest. Kaylyn Krul controlled the ball near midfield and pushed a pass ahead to Pierce. She pulled up in front of a defender and switched the ball to her right foot, then lofted a high, 26-yard shot that floated over Young and into the far left-hand corner of the goal. Scarborough responded by playing with more urgency. That led to a shot from the left wing that was deflected out of bounds for a corner kick at the 26:30 mark. The corner produced no threat and, after another shot went over the end line off a Camden Hills player, the ensuing corner led to a long shot from the right side that sailed wide to the left of the goal. One of the Red Storm’s best scoring chances came on a corner from the left side with three minutes to play in the half. Ashley Sabatino’s offer clipped the support near the crossbar and went out of bounds. Molly Murnane was the instigator for a couple of potential threats by Scarborough in the second half. But the Camden Hills defense, including Grace Blackwell, Eve Gutheinz, Sara Spizzuoco and Tessa Whitley — along with goalie Isabelle Lang — kept the Red Storm mostly to the outside and didn’t give up any glowing chances. Scarborough controlled play for a few minutes midway through the half, but could not put anything together. Young made a dozen saves in the second half alone, including a diving stop on a shot by Kassi Krul with 3:25 remaining. The Windjammers were able to bleed the clock after that and secure the victory.